Welcome to more "Cover to Cover" for your week! We are not breaking off a separate voicemail show... this double shot is something a little bit different. Show A will continue to be about writing, publishing, and interviews with authors, while Show B will focus on listener feedback, but also contain book reviews and commentary, and some other informative segments. 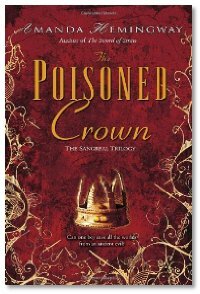 Interview: Michael, Brian and Lorrie talk with British author Amanda Hemingway about the final book in her Sangreal Trilogy, The Poisoned Crown, widely acclaimed as the best of the series. She's also working on a new series based on an occassionally recurring character in some of her earlier works. Amanda also writes under several different pseudonyms to cover the variety of story styles that she writes in, but not all of them are available in the US, so if her premises intrigue you, you'll have to do a little digging to find some of the other books. Discussion: Michael, Michael and Summer discuss how huge Comic-Con has become, with the expansion of panels and promotions, and how maybe the movie business has completely changed the focus and feel of Comic-Con. Scifi is here to stay, people. Man, my reading list just keeps growing with every C2C lately. Not that that's a bad thing! Thanks for the interview - I've never noticed Amanda's stuff on the shelves before 🙂 Very interested in the comic novels she's written as well - happily, they shouldn't be hard to find here in Oz.